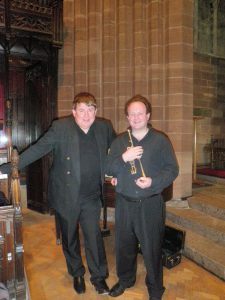 The regular trumpet and organ duo, of Ian Tracey & myself will be displaying our wares next, on Thursday 19th December! This will be a 1pm lunchtime concert in the wonderful Art Deco surroundings of the main concert room of Liverpool Philharmonic Hall. Tickets are selling well, at this early stage, but there are still plenty available for those wishing to attend. The programme will include many of the trumpet and organ voluntaries Ian & I are regularly programmed to play plus, due to the time of year, a festive theme will also be running through the concert, including some carols with trumpet descants. Ian will be performing a couple of his famous interpretations of virtuoso solo organ items, too! The organ was built by the Liverpool firm of Rushworth and Dreaper in 1939 with a console which can be raised or lowered from the stage. One of the charities which will be using the event to raise awareness of issues, as well as raising some funds, has printed it’s own publicity posters. 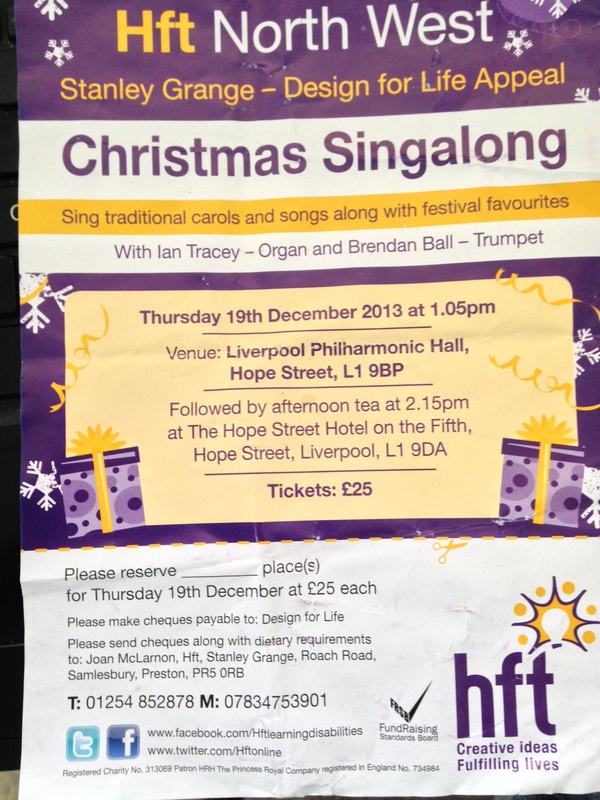 Unfortunately, they are advertising the event as a ‘Christmas Singalong’! Needless to say, we won’t be doing a Xmas singalong, as such, but a recital of trumpet & organ music which will have a strong Xmas theme running through it, including some Carols with descants etc! Don’t be put off by the ticket price on the poster either. That is the price for the full charity event. Tickets for the 19th December 1.05pm lunchtime recital Brendan Ball/Ian Tracey will be £6 for eveyone just wishing to attend the performance. It incorporated an organ built by the Liverpool firm of Rushworth and Dreaper with a console which can be lowered from the stage. Some ‘unfortunately worded’ publicity posters! After this event, apart from regular Xmas work with the Royal Liverpool Philharmonic Orchestra (a very busy period), I’ll be taking a short break from solo playing until in the New Year, apart from the annual performance of Handel’s great Oratorio, ‘The Messiah’, at Liverpool Philharmonic Hall on January 11th, with the RLPO/Choir (choir trained by Ian Tracey himself!) and Ottavio Dantone conducting. I shall be playing ‘The Trumpet Shall Sound’ with bass Matthew Rose. The other soloists will be: soprano – Lucy Crowe; Alto – Patrick Von Goethem and tenor – Daniel Johannsen. This entry was posted in About Brendan Ball, The Tour Blogs & Brendan's Solo Blogs and tagged 'RLPO', Andre, anglican, ball, brendan, carols, cathedral, charity, choir, christmas, concert, crowe, daniel, dantone, duo, festive, goethem, Hall, ian, johannsen, liverpool, lucy, lunchtime, matthew, Maurice, orchestra, organ, ottavio, patrick, philharmonic, Piccolo, recital, rose, royal, solo, titulaire, tracey, Trumpet, voluntaries, voluntary, von, xmas. Bookmark the permalink. 2 Responses to Brendan’s latest Solo Performances! “Carlos with descants” sounds like the Spanish waiter will be running down the stairs. !